Spaghetti sidekick, potluck staple, hoagie superstar: What’s not to love about meatballs? What do you think of when you hear the word “meatballs?” Italian? Ham? Swedish? I think about those more traditional types of meatballs, but my mind and stomach also think about my favorite sandwiches. From a Cuban to a Greek gyro to a buffalo chicken sandwich, what is a meatball but a deconstructed sandwich? The options are truly endless. They’re healthy! Meatballs are a great source of protein. Using lean ingredients can result in a savory main dish with less fat and calories. Meatballs are versatile. They can be served alone as a main dish or appetizer, in a sandwich or soup, combined with pasta or on top of a pizza. You can get creative. For starters, beef, pork, chicken, turkey or tofu can be made into meatballs. When you’re trying new combinations, think about the spices and the fat and moisture content of the meat, and adjust the other ingredients for balance. They’re time savers. You can make a big batch in advance, enjoy a meal or two and freeze the rest for future quick meals or snacks. Meatballs are kid friendly. All ages can help measure, mix and shape. Small meatballs are bite-size and can be skewered or nibbled right off a toothpick. They’re inexpensive. A standard batch of homemade meatballs can be made for about $5. 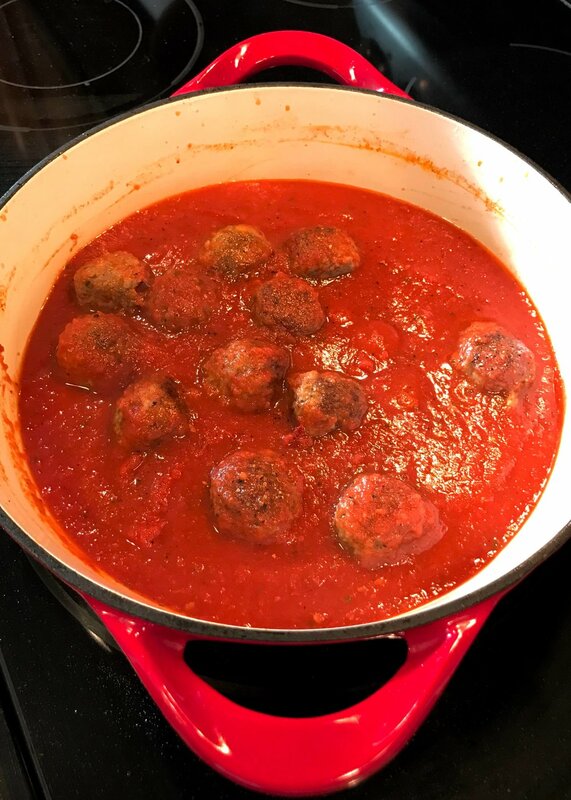 In honor of National Meatball Day on March 9, I have created an Iowa-Inspired Italian Meatball recipe. I don’t think I have a single strand of Italian genetics in my DNA. However, having lived in Iowa my entire life, I do know the care Iowa farmers bring to producing safe, wholesome ingredients. Courtesy of farm-fresh ingredients, such as beef, pork, turkey and eggs, I present you with my go-to recipe for Italian-style (but Iowa-inspired) meatballs. These poppable protein sources can stand alone as a main dish or steal the show of pasta, pizza, soup and sandwich meals. No matter which way you choose to serve these meatballs, your family is sure to enjoy! Meatball tip: Not all bread crumbs are created equal. If the crumbs are flaky, the meatballs will turn out light and tender. If the crumbs are dense, the meatballs will be dense. Your choice of crumbs will not ruin the recipe but it will change the texture. Save money by making your own from leftover or dried-out pieces of bread or buns. Place turkey pepperoni in a food processor and pulse to finely chop. In a large bowl, combine all ingredients, except milk, by hand. Add 1/2 cup milk and mix by hand until well-combined. If mixture does not hold together easily or seems dry, add more milk, a little at a time, until the mixture can be easily formed into balls. Form meatballs using a cookie scoop to ensure consistent sizes. Meatball tip: Begin making the meatball mixture with only half of the liquid called for in the recipe. Different types, and even brands, of ground meat have different levels of moisture. Adding too much liquid will keep the meatballs from holding their shape. 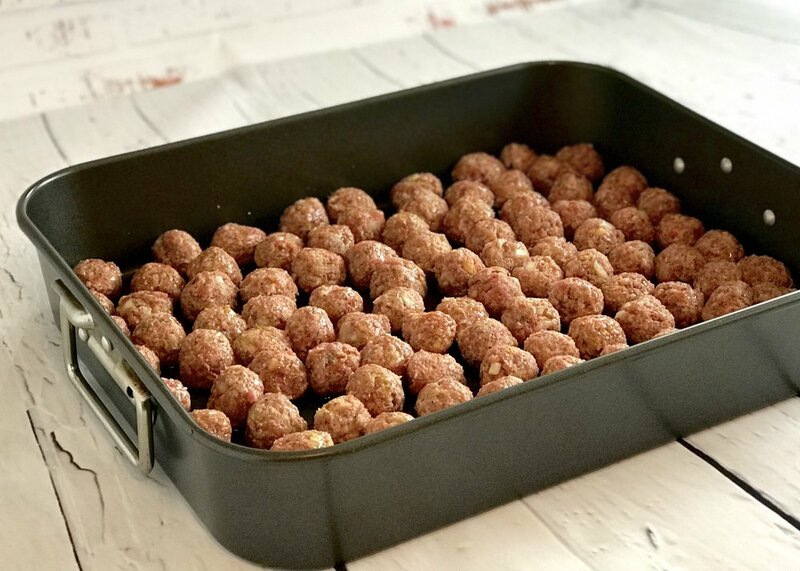 Drizzle olive oil in the bottom of a large roasting pan or two 9”x13” pans and place meatballs inside. Bake for 20 minutes for smaller (1 1/2”) meatballs or 30-35 minutes for larger (2”) meatballs. Cut one meatball in half to ensure doneness. The inside should be consistent in color and texture. Since this recipe contains poultry, it is especially important to cook them properly (165 degrees F). Drizzle olive oil in a large Dutch oven or sauté pan and bring to medium or medium-high heat. Add desired number of meatballs to the pan without crowding and brown on all sides. Add spaghetti sauce or favorite pasta sauce to meatballs in the pan, reduce heat, cover partially and simmer for at least 15 minutes to finish cooking the meatballs. This recipe (as is the case for all my meatball recipes) makes a big batch. You can halve the recipe. I like the large batch because I not only want a meal or two when I make them, but I want to freeze some for another time. For this article, I made 12 larger meatballs and prepared them with the stovetop method for a pasta dinner. Meatball tip: Meatball versatility doesn’t stop with the ingredients. You can also get creative with your cooking methods. If you don’t want to heat up the oven in the summer, use your stovetop or grill! If you simply want to set a timer, bake them. You can be adventurous and try cooking them in a deep-fryer or air-fryer. I’ll be happy to come over and taste test! The remaining mixture was made into small meatballs (about 90) and prepared with the oven method. When finished baking and cooling, I divided the meatballs into quart-sized resealable bags and placed in the freezer for future meals. Or, more likely, each of my boys will receive a bag of meatballs for their future meals. Want to help give meatballs the glory they deserve? Make this meatball recipe or another of your favorites and post a picture on social media. 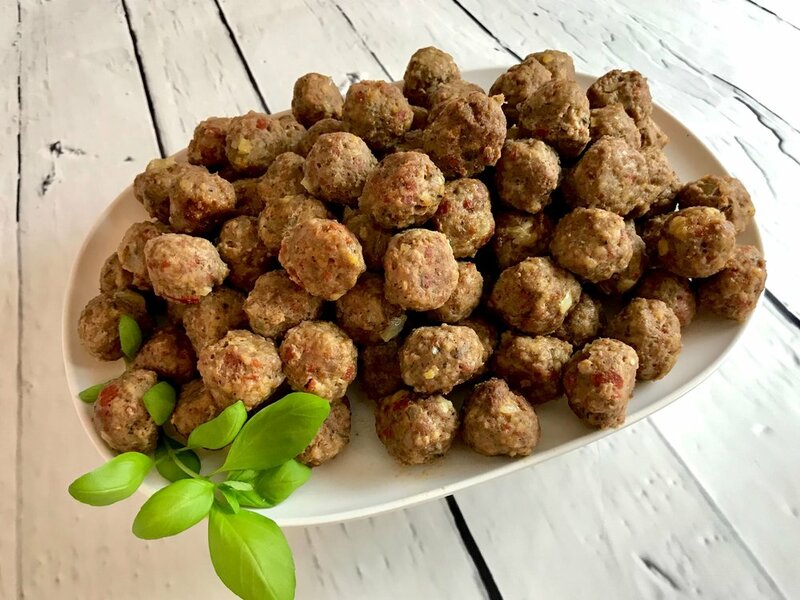 Be sure to tag Picnic Life Foodie (@Picniclifefoodie) and Iowa Food & Family Project (@foodnfamilies) in the post so we can see your family making and enjoying meatballs!